Kerry James Marshall sells to the black A-list, but pokes fun at his big‑bucks status, and Mantegna and Bellini go head to head — who comes out on top? It is not often you should feel sorry for an artist whose work has recently sold at auction for $21.1m. 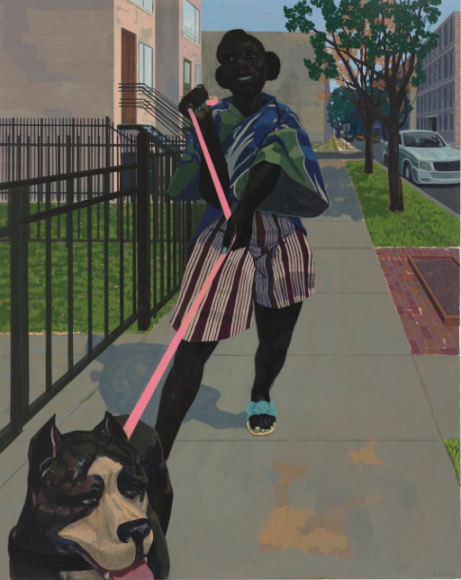 But in the case of the African-American painter Kerry James Marshall, we need to make an exception. And when the spender of all that cash is the rap impresario Diddy — who I believe used to be known as Puff Daddy — it only makes it worse. However respected you are as an artist, however noble your trajectory, however transparently you side with the angels in the battle for good in art, having a moneyed braggadocio throw enough loot at your work to feed an African region for a year is conscience-testing and transformative. Marshall was one kind of artist before Diddy dumped on his halo, and another kind of artist after. That he knows this, that he is aware of the complications inherent in his situation and feels the need to tackle them, is made intriguingly clear by his first London show since the disfiguring Diddy overspend in May. 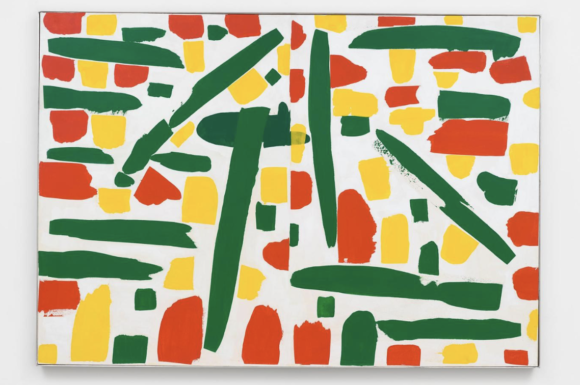 In an exhibition grandly entitled History of Painting, at the super-successful David Zwirner gallery, Marshall pokes around playfully with his new financial status, draws our attention to it and even mocks it, while hoping inside — I suspect — that he still counts as one of the good guys. The entire exhibition is, on the deepest of its several levels, a conscience test. Before he became an auction record, Marshall was best known for his unceasing effort to force black storylines into the overwhelmingly white history of art. Born in Birmingham, Alabama, in 1955, he has had a lifetime of practice at noting the absence of black presences in art. And for most of his long career, his most obvious ambition was to right this wrong: to paint pictures that celebrated and included black life and that sought, as well, to deal cleverly with the pictorial implications of blackness. Here and there in the Zwirner show, he is still at it, ruminating on the loaded pigmentary issue of blackness, as well as its loaded social meanings. A pair of beautiful portraits of a black couple, intended as a diptych, one set in the daytime, the other at night, is actually called Day and Night. The woman has the sun behind her, which causes her face to fall into further shadow, while the edges of her backlit hair glow with unexpected hints of chestnut. The man, meanwhile, measures his full blackness against the night sky in a colorific conundrum that involves the painterly exploration of the darkest shades of the spectrum. Technically, it’s a masterclass in what the French call contre-jour — painting against the light. Emotionally, it’s a celebration of black love, distinguished by its warmth and its gentleness. Typical Marshall. Marshall at his soppy best. The Marshall who dinged Diddy’s dong. But this show is as interesting as it is not because of its typical Marshalls, but because of the atypical ones. Flanking and facing Night and Day is a series of gaudy billboard images packed with the kind of money offers that trashy supermarkets shove through your door. “Pizza prices slashed!” “Buy two, get one free.” Except in this case the offers relate not to supermarket sales, but to contemporary art. What they actually record are the obscene prices paid for art at auction in New York in May 2007, just before the great crash: $71,720,000 for Warhol, $19,080,000 for de Kooning, $2,952,000 for Basquiat. Bingo numbers with bingo reality. Half a dozen of these painted flyers, with their deliberately crass graphics announcing the crass trade in art-world reputations, are scattered through the display. Their job is to give it a cheeky and unexpected twist. As both a victim and a reward-grabber in the obscene financial transformation of contemporary art, Marshall is, I reckon, attempting the old schoolboy trick of shouting “Look over there!” while he escapes in the opposite direction. But it remains brave and wise of him to try all this. I’m less sure of the abstract paintings that constitute the second of the show’s surprises. Deliberately dumb, with gaudy blobs of colour plonked crudely on simple white backgrounds, they are, I hope, another mickey-take, aimed, perhaps, at Damien Hirst’s Spot Paintings and the huge sums they fetch. Either that or Marshall is deluding himself about his talents as an abstractionist. All in all, though, a genuinely thoughtful show in which a restless painter has smartly expanded his repertoire to include provocative probings of the value of art. Happily, it also contains enough of the old Marshall to delight us more directly. The best such moment is a grand gallery interior showing somewhere like the National Gallery in London, except that all the visitors looking at the art — kids, students, lecturers, day trippers — are black. Having just been to the National Gallery before coming to Marshall’s fierce and rousing show, I can vouch for the complete inaccuracy of his observation. And that, of course, is the point. Painted in sepia tones on a burnt umber background of the sort used by Renaissance artists, Untitled (Underpainting), as the big gallery interior is sneakily called, is a punchy pictorial negative with ambitions to frame and magnify the opposite of what it depicts. It is both a clever technical exploration of painted blackness and a pained howl at museum norms. At the real National Gallery, an exciting pairing of Mantegna and Bellini explores one of the tightest relationships in Renaissance art. Mantegna (c 1431-1506), from Padua, and Bellini (c 1430-1516), from Venice, weren’t just geographically and chronologically close. They were brothers-in-law, with Mantegna marrying Bellini’s sister in 1453. 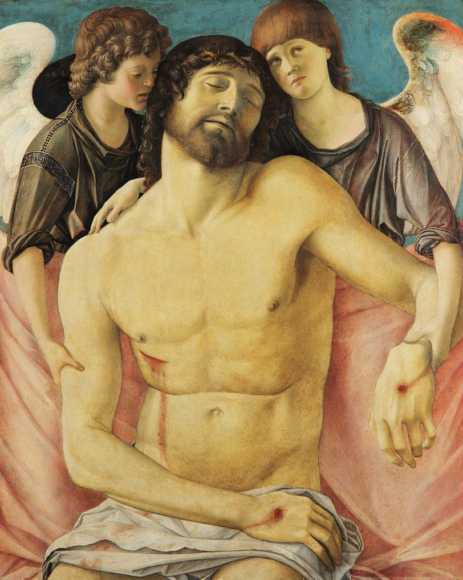 Regular visitors to the National Gallery will be aware already of this closeness because their versions of The Agony in the Garden have regularly been hung side by side to emphasise their similarity. Painted a couple of years apart, the two pictures, so alike at first sight, grow increasingly separate the longer you look at them, a trajectory enlarged and dramatised by this riveting show. 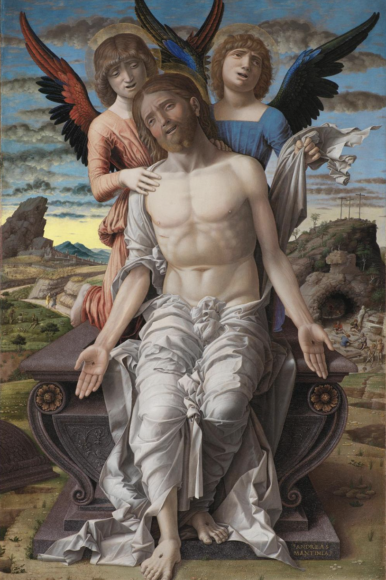 Although the younger of the two, Mantegna is the first out of the blocks with some startlingly original religious art. His gorgeous Presentation at the Temple, from 1454, sees him crowding the picture space with figures that seem to push themselves onto our side of the canvas. How close they come. I hadn’t previously realised what an exquisite painter of cloth he was. Or how gentle and beautiful his Madonnas were. Twenty years later, Bellini copied the same picture, but could only manage a weaker version. It’s the story of the show. So great was Bellini’s fame as the father of Venetian art that I imagined he would immediately emerge as its most brilliant contributor. But the opposite happens. It’s Mantegna, so often dismissed as a stony copyist of classical art, who impresses first with his big invention, his brave colour sense, his emotional heft and surprising warmth. You see the difference most starkly in two painted friezes, both of which try to resemble Roman reliefs. Mantegna’s is coiled, energetic, fascinatingly detailed. Look what effort he puts into capturing the variegated beauty of all that feigned marble. Bellini’s attempt, however, seems to go through the motions. The marble is purple. The figures are grey. Where the Mantegna grabs you by the lapels and pulls you close, the Bellini waves at you from somewhere over there. Only in the display’s final stretches, after Mantegna’s death, does Bellini come fully into his own with an outrageously inventive Drunkenness of Noah. Sloshed and naked, Noah has collapsed across the entire front of the picture, while his embarrassed sons, squeezed into the corners, try shyly to cover his nakedness. It’s all set right under our noses, pressed against the foreground. Just like a Mantegna.